In today’s A Lab Aloft, our guest blogger, CASIS Chief Operating Officer Duane Ratliff, shares the secret to success in doing business with the International Space Station. “How do I get my research into space?” It is easily the most common question I receive when travelling across the country to support the Center for the Advancement of Science in Space (CASIS) at meetings and targeted events. After all, many scientists have been conditioned to think that microgravity research is expensive, complicated and, frankly, a mystery. These misconceptions lead to the second—and understandable—question I get from a business perspective, which is, “Why should I invest time or money into sending my company’s research into space when I can invest right here on the ground?” This is where the exciting conversation begins on how to use the International Space Station U.S. National Laboratory as your research platform. Why? It is nowhere near as intimidating or as expensive to send your investigations to the stationas you might think. We are talking about a laboratory that is about 220 miles away from any lab on the ground—granted, that’s altitude, but it’s only about the distance from New York City to Boston, not light years away. And in this new era of space exploration, there are multiple launch providers to ferry one’s research to the station. And, perhaps most importantly, CASIS provides assistance in many ways to make your research aboard the station a reality. 1) Broker research that exploits space-specific experimental conditions, enabling innovation that will benefit humanity and thus create a tangible return on investment for the U.S. taxpayers that invested in construction of the space station. 2) Advocate the benefits of conducting research on the National Lab to potential investigators and to the public at large. With that background on our organization, let’s revisit the original question: How does a researcher get their investigation into space using the CASIS–National Lab model? CASIS has two methods by which we receive ideas for research: solicited and unsolicited research proposals. CASIS periodically issues calls for solicited proposals focused on promising areas of research. To date, CASIS has issued three Requests for Proposals (RFPs) in the fields of protein crystallization, materials science (using the NanoRacks External Platform that will mount to the exterior of the station) and stem cell biology. The stem cell RFP is currently open for proposal submission until July 25, 2013. Once an interested party submits a proposal, we evaluate it for flight feasibility, scientific merit and potential economic impact (i.e., the potential to provide tangible or humanitarian return on investment to taxpayers). Qualified projects receive grant funding awards. Last year alone, during our first full year of functioning as manager of the National Lab, CASIS set aside over six million dollars to fund space-based research. Our goal is to issue RFPs in targeted and promising research disciplines once per quarter as we move forward. Additionally, researchers can submit unsolicited proposals at any time through the CASIS website. CASIS firmly believes this construct encourages submittal of outside-the-box ideas from entrepreneurs and companies looking for a competitive edge. This ultimately increases the National Lab’s ability to improve life on Earth as results and technology spinoffs come to light. Proposals submitted in this way are vetted similarly to solicited proposals, using the same CASIS evaluation and prioritization framework. This is true for all proposals. As a nonprofit, CASIS seeks to build a National Lab research portfolio that has the best chance of providing benefit to humanity—we are not swayed by the financial capabilities of large companies, and investigators do not need to have any previous experience in space. The best part? Even if an idea is not chosen for flight consideration, applicants still receive feedback to improve their proposal. Our intention is to be as supportive in the proposal process as possible, ultimately improving our likelihood of finding qualified research for flight. Finally, on a case-by-case basis, CASIS is in a position at times to contribute funding to unsolicited proposals that fit within research pathways of interest. Congratulations, your research was selected for flight! Now what? From there, CASIS functions as the middle man, facilitating service provider partnerships and flight coordination of projects to and from the space station. We assist in finding funding for qualified unsolicited proposals; we pair your research with proven, certified hardware providers (implementation partners); and we provide assistance to ensure integration of your research with NASA launch requirements and schedules. Our role is to take the stress out of sending research to the station and allow proposers to focus on what matters most: their research. I’d like to address the bottom line issue for prospective users: cost. How expensive is it to send research to the space station? While there is no clear-cut answer for average overall expense, the salient point is that it is a lot less than you’d think, and a lot less than it used to be. As an investigator funding your own project, the only financial responsibility you have is funding your research on the ground (to prepare for flight and to perform ground control experiments). If you work through CASIS to fly your research, NASA will absorb flight and crew-time costs, which in the past were often prohibitively expensive. In short, getting your research into space involves writing a quality proposal and then allowing CASIS to assist you in working with NASA and implementation partners to prepare your research for successful flight experiments—at minimal cost. This new paradigm for space research seeks to enable easy and productive use of the National Lab for U.S. researchers from all institutions: academic, industry and government. Interested in learning more about the opportunities aboard the National Lab and how the CASIS–National Lab model can accelerate your research discoveries? If so, consider attending the upcoming 2nd Annual American Astronautical Society International Space Station Research and Development Conference, which will be held July 16-18, 2013 in Denver, Colo. This conference will outline the full benefits and opportunities that exist on the station, and NASA and CASIS will both present on how to do business with the station. Specifically, a workshop slated to take place on July 18 will educate potential new users about accessing the station, and CASIS implementation partners will be on hand to showcase their hardware and service capabilities. I highly encourage anyone interested in space-based research to attend this conference and to speak with CASIS representatives about how the National Lab can benefit your specific research objectives. We are entering a new era in space exploration. With the creation of the National Laboratory, there is now a “nontraditional” way to access the space station, and commercial companies (e.g., SpaceX, Orbital Sciences) now provide increased transportation services and ever-improving capabilities. With time, the measurable success of the National Lab model will establish CASIS as the premier gateway to one of humanity’s greatest technilogcal achievements. From sponsored solicitations to wild, out-of-the-box ideas, CASIS serves as the ultimate facilitator to taking your research to new heights—promoting and enabling maximum use of and benefit from the National Lab research platform. 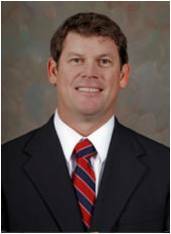 Duane Ratliff, CASIS Chief Operating Officer, has most recently served as senior vice president at Dynamac Corporation, with operations expertise in supply chain management, government program management, space-based R&D, biotech facilities support, and payload development and execution. He also served as the liaison between Space Florida and NASA’s Kennedy Space Center for all operations and logistics planning for the Space Life Sciences Laboratory. Ratliff attended undergrad at Merrimack College in Massachusetts and majored in Physiology. He then attended Yale University and earned a Master of Public Health focusing on Occupational/Environmental Health Science. In today’s A Lab Aloft, guest blogger Liz Warren, Ph.D., recalls the inspirational contributions and strides made by women in space exploration and International Space Station research. This month we celebrate the anniversaries of three “firsts” for female space explorers. On June 16, 1963, Valentina Tereshkova of the Soviet Union became the first woman in space. 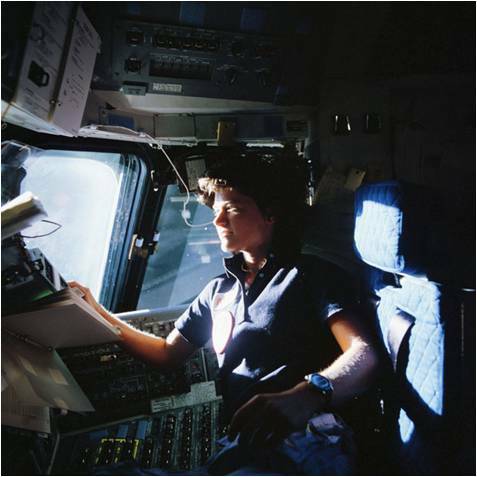 Then on June 18, 1983, Sally Ride became America’s first woman in space, followed by Liu Yang as China’s first woman in space on June 16, 2012. Though their flight anniversaries are not in June, I would be remiss if I did not mention the first European woman in space: Helen Sharman in 1991; the first Canadian woman: Roberta Bondar in 1992; and the first Japanese woman: Chiaki Mukai in 1994. Each of these milestones built upon each other by inspiring the next wave of female explorers, continuing through today with the women of the International Space Station and beyond. With this in mind, I’d like to take a moment to celebrate women in space and highlight those with a connection to space station research. It is amazing to me to see just how connected these seemingly separate events can be. The steps of the intrepid explorers who engage in space exploration set the course for future pioneers, blazing the trail and providing the inspiration for those who follow. To date, 57 women including cosmonauts, astronauts, payload specialists and foreign nationals have flown in space. Our current woman in orbit is NASA astronaut Karen Nyberg, working aboard the space station as a flight engineer for Expeditions 36 and 37. While Nyberg lives on the orbiting laboratory for the next six months, she will perform experiments in disciplines that range from technology development, physical sciences, human research, biology and biotechnology to Earth observations. She also will engage students through educational activities in addition to routine vehicle tasks and preparing her crewmates for extravehicular activities, or spacewalks. Many of the women who have flown before Nyberg include scientists who continued their microgravity work, even after they hung up their flight suits. In fact, some of them are investigators for research and technology experiments recently performed on the space station. Whether inspired by their own time in orbit or by the space environment, these women are microgravity research pioneers ultimately looking to improve the lives of those here on Earth. 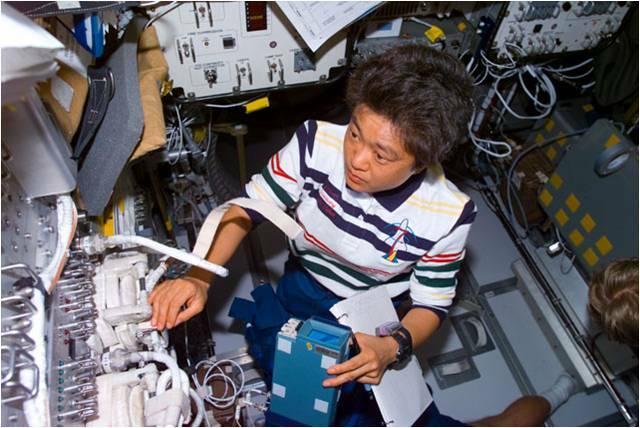 Chiaki Mukai, M.D., Ph.D. of the Japanese Aerospace Exploration Agency, for instance, served aboard space shuttle missions STS-65 and STS-95. She now is an investigator for the space station investigations Biological Rhythms and Biological Rhythms 48, which look at human cardiovascular health. 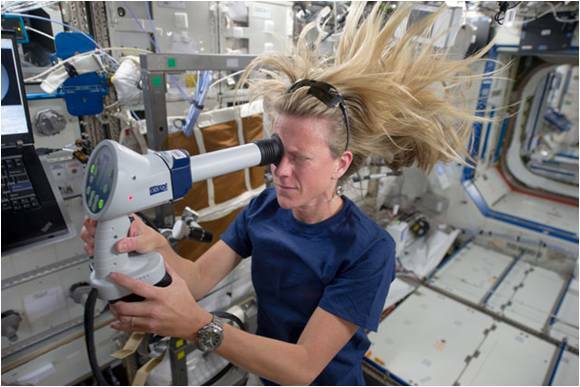 She also is the primary investigator for Hair, a study that looks at human gene expression and metabolism based on the human hair follicle during exposure to the space station environment. 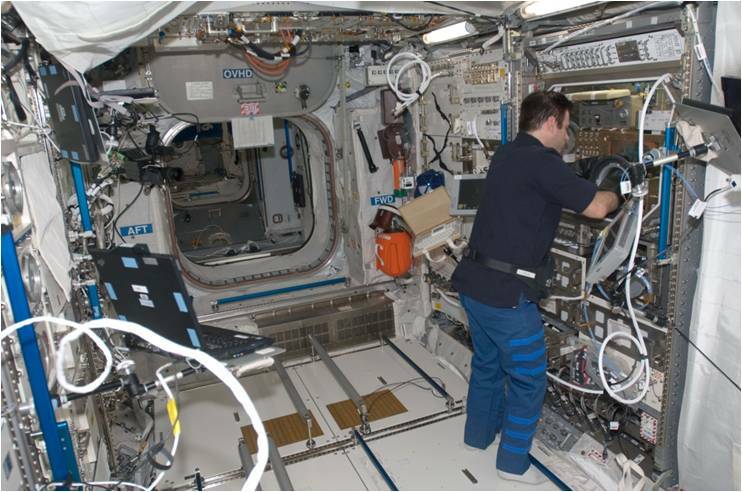 Myco, Myco 2, Myco 3, other investigations run by Mukai, look at the risk of microorganisms via inhalation and adhesion to the skin to see which fungi act as allergens aboard the space station. Finally, Synergy is an upcoming study Mukai is leading that will look at the re-adaptation of walking after spaceflight. 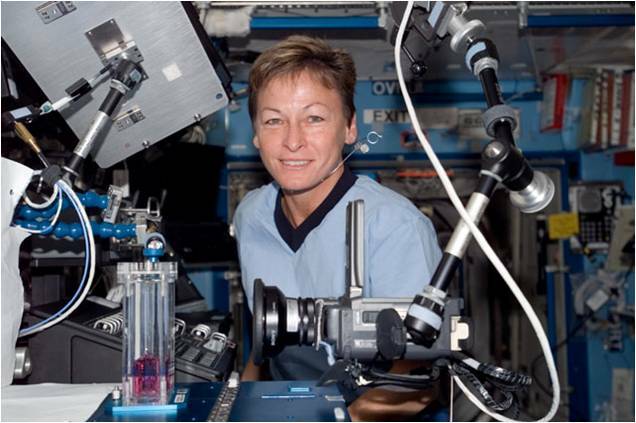 Peggy Whitson, Ph.D. served aboard the space shuttle and space station for STS-111, Expedition 5, STS-113, and Expedition 16. She also is the principal investigator for the Renal Stoneinvestigation, which examined a countermeasure for kidney stones. Results from this science have direct application possibilities by helping scientists understand kidney stone formation on Earth. 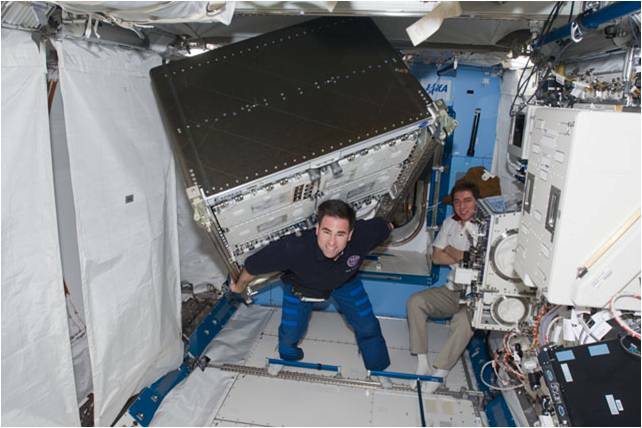 Whitson, who blogged with A Lab Aloft on the importance of the human element to microgravity studies, also served as the chief of the NASA Astronaut Office at the agency’s Johnson Space Center in Houston from 2009 to 2012. Sally Ride, Ph.D. (STS-7, STS-41G) initiated the education payload Sally Ride EarthKAM, which was renamed in her honor after her passing last year. This camera system allows thousands of students to photograph Earth from orbit for study. They use the Internet to control the digital camera mounted aboard the space station to select, capture and review Earth’s coastlines, mountain ranges and other geographic areas of interest. Millie Hughes-Fulford, Ph.D. (STS-40) has been an investigator on several spaceflight studies, including Leukin-2 and the T-Cell Activation in Aging study, which is planned to fly aboard the space station during Expeditions 37 and 38. 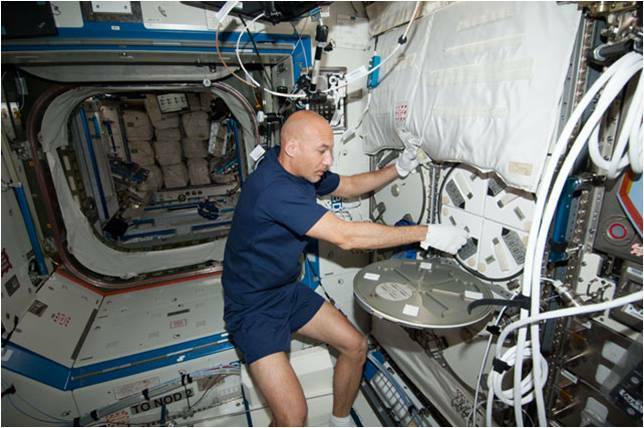 This research looks at how the human immune system responds to microgravity, taking advantage of the fact that astronauts experience suppression of their immune response during spaceflight to pinpoint the trigger for reactivation. This could lead to ways to “turn on” the body’s natural defenses for those suffering from immunosuppression on Earth. Hughes-Fulford has been a mentor to me since I was in high school. It was Hughes-Fulford who encouraged me to pursue a career in life sciences, and she also invited me to attend her launch aboard space shuttle Columbia on STS-40, the first shuttle mission dedicated to space life sciences. In fact, STS-40 also was the first spaceflight mission with three women aboard: Hughes-Fulford; Tammy Jernigan, Ph.D.; and Rhea Seddon, M.D. I followed Hughes-Fulford’s advice, and, years later, I found myself watching STS-84 roar into orbit carrying the life sciences investigation that I had worked on as a student at the University of California, Davis. In the pilot’s seat of shuttle Atlantis that morning was Eileen Collins, the first woman to pilot and command the space shuttle. Our investigation, Effects of Gravity on Insect Circadian Rhythmicity, was transferred to the Russian space station Mir, where the sleep/wake cycle of insects was studied to understand the influence of spaceflight on the internal body clock. 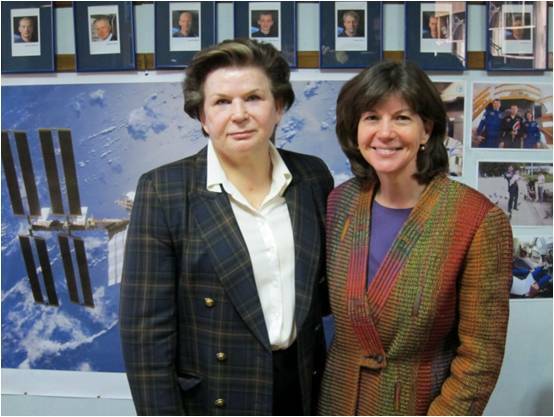 Women at NASA always have and continue to play key roles in space exploration. Today we have female flight controllers, flight directors, spacecraft commanders, engineers, doctors and scientists. 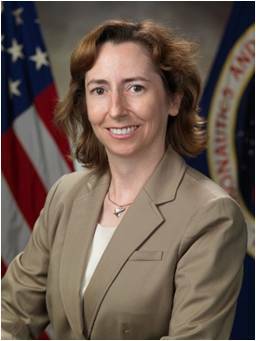 In leadership positions, Lori Garver is at the helm as NASA’s deputy administrator, veteran astronaut Ellen Ochoa is director of Johnson; and Lesa Roe is director of NASA’s Langley Research Center in Hampton, Va. In space exploration and in science, we stand on the shoulders of those who came before us. These women pushed the boundaries and continue to expand the limits of our knowledge. What an incredible heritage for the girls of today who will become the scientists, engineers, leaders and explorers of tomorrow. Liz Warren, Ph.D., is a physiologist with Barrios Technology, a NASA contractor. Her role in the International Space Station Program Science Office is to communicate research results and benefits both internally to NASA and externally to the public. Warren previously served as the deputy project scientist for Spaceflight Analogs and later for the ISS Medical Project as a science operations lead at the Mission Control Center at NASA’s Johnson Space Center in Houston. Born and raised near San Francisco, she has a Bachelor of Science degree in molecular, cellular and integrative physiology and a doctorate in physiology from the University of California at Davis. She completed post-doctoral fellowships in molecular and cell biology and then in neuroscience. Warren is an expert on the effects of spaceflight on the human body and has authored publications ranging from artificial gravity protocols to neuroscience to energy balance and metabolism. In today’s A Lab Aloft, guest blogger Liz Warren, Ph.D., explains the flexibility in science capability on the International Space Station, thanks to the modular design of the research racks aboard the orbiting laboratory. People are often shocked when they learn that the International Space Station is as large as a football field. They are also surprised to know that the interior volume is 32,333 cubic feet; that’s about the size of a five-bedroom house. Even though that is a very large volume, it pays to use ‘space’ smartly in space. In order to be most efficient with the interior volume of the space station, the orbiting laboratory contains modular science facilities, usable by multiple investigators and experiment types. In fact, some of the facilities aboard the station are engineered for easy modification to meet the needs of different users. These ‘shared’ facilities enable efficient research utilization time aboard the station. Making facilities modular also allows for upgrades so that the space station stays on the cutting edge of science. 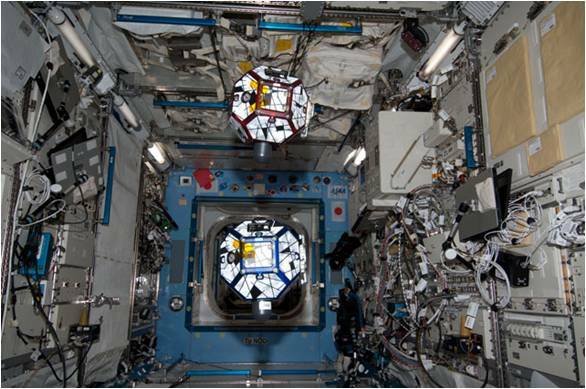 Inside the Destiny, Kibo and Columbus laboratories, the walls, ceilings and floors are lined with science “rack” facilities. These racks, each similar in size to a big refrigerator (about 79.3 in. high, 41.3 in. wide, and 33.8 in. deep), are curved in the rear so that they fit almost flush against the inside surface of the cylindrical space station laboratory modules. The racks themselves are modular for easy relocation within the station as needed. Some racks are built for housing several small-sized investigations. These EXPRESS racks provide power, air and water cooling, data and exhaust, command and control for up to a dozen different investigations. EXPRESS stands for Expedite the Processing of Experiments to the Space Station, reflecting the fact that this system was developed specifically to maximize the space station’s research capabilities. Other racks are specialized for specific disciplines such as combustion, fluids, materials, human research and Earth observation. There is also a glovebox that is suitable for handling and containing hazardous materials and several freezers to preserve science samples. As a National Laboratory, the station science facilities built by NASA are available on a time-shared basis to other U.S. government agencies and private entities, such as commercial companies and universities, to pursue their own mission-driven research and applications. Shared use of international capabilities can also be arranged between NASA and the International Space Station partner agencies. Scientists that find they need a facility for their experiment that does not currently exist in orbit can work with their sponsoring organization to develop new hardware, which NASA will launch without cost to the scientist. To highlight the capabilities of some of the space station’s science racks, Space Center Houston, the visitor center at NASA’s Johnson Space Center, enlisted help from the International Space Station Program and Space City Films of Houston to produce a unique video display for an updated space station exhibit. The exhibit is designed to educate and excite visitors about the accomplishments and importance the station plays in our continued human presence in space and the research conducted there. The video display is actually a large wall, onto which the video projects from the back for a vibrant, life-sized, interactive experience! I assisted in the production of this video for visitors to Space Center Houston to enjoy, providing images, video and scientific content. Viewing the finished product for the first time on a recent visit was fulfilling, but I know there is more work to be done to communicate the value of space station research. The International Space Station is a premier, world-class laboratory in low-Earth orbit that promises to yield insights, science and technologies, the likes of which we have only begun to comprehend. 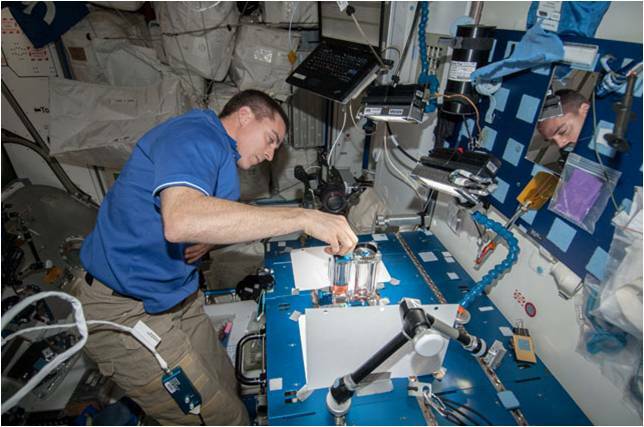 With the capabilities of our research racks and facilities, investigators can use microgravity to unlock fundamentals of combustion, fluids, physiology and more to improve life on Earth in addition to supporting future space exploration.